The Creation Wiki is a free internet encyclopedia of creation science that was founded and is supported by the Northwest Creation Network. Like most wikis, the Creation Wiki is designed to be a collaborative effort and virtually every page of the archive can be edited by our registered users. The articles on the Creation Wiki are written specifically from the "creationist point of view" (CPOV), which holds that the universe and life on Earth were created by God. Because of the unique purpose of the Creation Wiki in providing a point-of-view digest, only creationists are permitted to edit articles. Non-creationists (or atheists) are prohibited from making any changes to text, except for spelling and grammar corrections. However, everyone is encouraged to review articles content using the adjoining discussion pages. Since its inception, the number of people involved with this project has grown steadily. There are currently 1,680 users, 9,223 total articles written from a creationist point of view, with 6,334 articles in the English language. 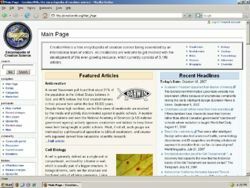 See CreationWiki translations for a full count of articles. For helpful information on how to get started with the Creation Wiki, consult the community portal. The Creation Point of View (CPOV) is a worldview that is derived from the belief that the cosmos and life on Earth were created by God (creationism). The purpose of the CreationWiki is to provide an encyclopedic archive of information relevant to the study of creation apologetics. Creation science, as preeminent in this field of apologetics, will constitute the primary focus of the site. NPOV - We are explicitly attempting to move away from the Neutral Point of View policy adopted by Wikipedia, because of the unique purpose of CreationWiki. CPOV - Articles should be written from the creation point of view (CPOV), which holds that the universe and life on Earth are the result of an act of creation by God. The young earth Biblical creationism position will remain the principal perspective on the CreationWiki, but non Biblical creation perspectives are welcome. Furthermore, almost any topic or content can find a home on this site provided that it be written from the uniquely creationist point of view. We require that editors register to protect against vandalism. Furthermore, automatic registration has been disabled due to malicious spambot activity. To join the Creation Wiki editorial staff, please request an account from the administration. Although anyone may review articles using the discussion pages, only creationists are permitted to edit articles on the Creation Wiki. Therefore, the account request form requires that applicants specify whether they hold to a creationist worldview. Following submission of the account request form the applicant must confirm the specified email address where the username and password will be subsequently sent. Please note that passwords are strictly confidential and even the administration is unable to access that information. User account will be permanently banned following vandalism or other misuse of this service. As many aspects of the creation remain largely theoretic, and many disagreements exist within the creation community, it is important that strict policies be in place to establish editing etiquette. All users are encouraged to familiarize themselves with the CreationWiki policies and guidelines, as continued participation is reliant upon the observance of these directives. Substantiative - Community collaboration supports the creation worldview with scientific validation. Peer Review - The articles posted on the Creation Wiki will be read and critiqued by many others. Free Webhosting - Publish on the web without needing independent web service. Improved Exposure - Articles receive high rankings on search engines due to the size and high number of referrals to the CreationWiki. The Creation Wiki operates from a fully dedicated server. As the number of users, pages, and languages has expanded over the years, the server has required several hardware upgrades. The most recent upgrade occurred May 2013. Please consider supporting the CreationWiki with a one-time or regular to help us pay this considerable expense. Due to its ever increasing activity level, in February 2008 a commitment was made to move the Creation Wiki to a fully Dedicated Server. It became necessary to upgraded the server in August 2010, again in June 2011, and most recently in May 2013. With a dedicated server we do not share computer resources with other websites, which means faster processing, and better reliability and performance. However, the cost to maintain a fully dedicated server is considerable and we could use your support. If you value this resource, please consider making a one-time or regular donation to help sustain its continued development. This page was last modified on 29 October 2018, at 14:58.